Indian Stone Paving from Paving Traders is the world’s finest natural stone at the best prices in the country. Because we source from our own quarries and sell direct, you can be assured of the highest standards of quality and the best value in the market. 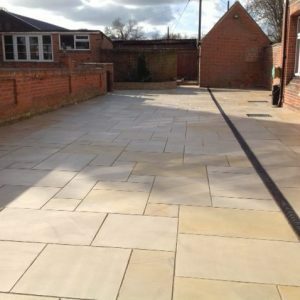 The Paving Traders’ Driveway Grade Paving is the only type we recommend for drives, parking areas or where you simply want a thicker, heavier duty slab. Our Calibrated Range can be used internally or externally, and for design projects where the flooring continues from inside to out. 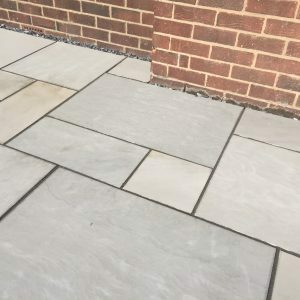 Sandblasted Indian Stone Paving enhances any location or use and imparts an impression of quality and luxury which only the finest natural stone can deliver. Our Sawn & Honed (Polished) range takes the natural beauty one step further, adding a contemporary, clean look with that added impression of luxury. 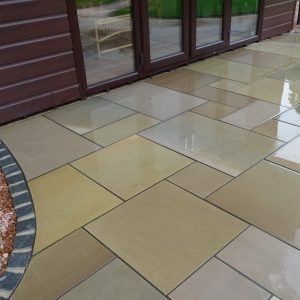 Tumbled and Aged or Tumbled and Brushed paving is a natural Indian Stone product which closely resembles reclaimed Yorkstone but at a fraction of the cost and far easier to lay than reclaimed stone. To complete and complement these, we also offer a superb range of Circles, Walling, Cobbles and Setts for the perfect finish.